Collegiate Marketing Group released its annual college spring break resource – the Coca-Cola Spring Break Guide – this week to college campuses throughout the United States. This year’s magazine is 74 pages, with focus once again on prime Spring Break destinations including Panama City Beach, Daytona Beach, South Padre Island, and introducing a more extensive look at Myrtle Beach and North Myrtle Beach. Special features in this year’s magazine include a spread about the upcoming Spring Break themed movie “Spring Breakers”, as well as South Padre Island’s third annual Ultimate Music Experience, and an interesting report on last season’s Guinness World Record-breaking bikini parade in Panama City Beach, Florida. The general mission of the Coca-Cola Spring Break Guide has always been to provide destination information in order to assist students in making their travel plans a success. Always keeping monetary budgeting in mind, the guide encourages students to make the most out of their Spring Break, outlining a variety of activities, points of interest, party hot spots, travel tips and a whole lot more. 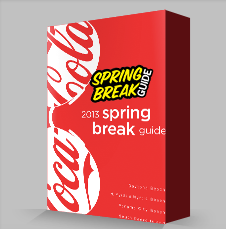 This year marks the 21st year that Coca-Cola has partnered to produce the Spring Break Guide. Youth marketing agency Collegiate Marketing Group is once again distributing the magazine to colleges and universities in both the USA as well as in Canada. An online version of the magazine is now available to be downloaded at http://www.springbreakguide.com.